Sangheili Enforcers are Banished Sangheili that specialize in destroying enemy structures. Banished Sangheili Enforcers are regularly armed with Type-25 Brute plasma rifles, Type-53 plasma casters, Type-1 plasma grenades, and stasis grenades. They wear Sangheili combat harnesses equipped with energy shielding. Sangheili Enforcers are exclusive to Arbiter Ripa 'Moramee and can be built at the Raid Camp in place of Jiralhanae Jumpers. Enforcers are effective against infantry and structures, perform okay against vehicles, and do poorly against aircraft. In Blitz Enforcers cost 40 energy. 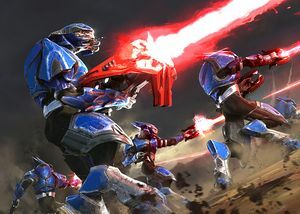 Sangheili Enforcers in Halo Wars 2.